The Republic of Honduras sits on the Atlantic Coast to the south of Guatemala and to the east of El Salvador. It was on this coast that Columbus first set foot on mainland America when he landed near the modern-day town of Trujillo on August 14th 1502 during his fourth and final voyage. He spent considerable time exploring the Honduras coast (about two months) looking for a river that would take him through to the Pacific. After failing to find such a river he headed down to Panama, although he never found a river and his dreams of finding a route west to Asia died with him, just four years later. Trujillo – La Fortaleza de Santa BarbaraCortes would soon be on his way. Olid was eventually killed, but how and when is not certain. Cortes eventually arrived from Mexico by land in 1525 to take control of the area. He founded two cities, La Natividad (now known as Puerto Cortés) and Trujillo , both of which have become important modern towns. The bay in which Columbus first landed is named the Bay of Honduras, which translates to the “Gulf of Depths” – a name that alludes to the deep waters that Columbus discovered in this region. The bay extends north to Belize and includes the small stretch of Atlantic coast that Guatemala owns. 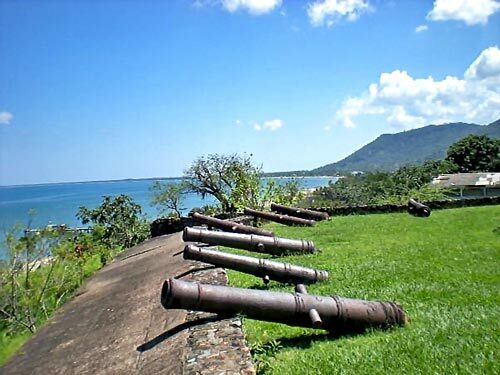 The settlement Columbus founded was called “Punta de Caxinas”, which lies within Trujillo. The town today is one of the main tourist attractions in Honduras and lies at the heart of an area known as the Bay of Islands. The islands, Roatan, Utila and Guanaja, are also top of Honduras’ tourist attractions, offering crystal clear blue waters for snorkeling and diving, with paradisiacal white sandy beaches and very few tourists! 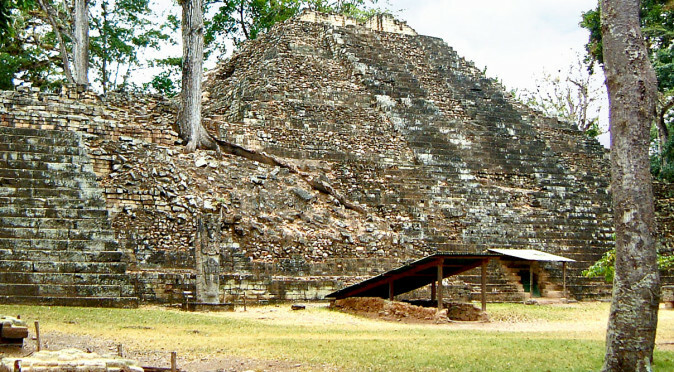 Temple of Inscriptions (South)However, the main attraction and the reason the majority of people visit Honduras is to marvel at the Mayan city of Copán. This UNESCO World Heritage Site sits just within the border from Guatemala – and is therefore annexed from rest of the Mayan heartlands which fan northward from just over the border in Guatemala. Thankfully, the Honduran Government doesn’t take advantage of the country’s luck in securing one of Mesoamerica’s finest ancient cities and rather than being held to ransom with expensive visa charges for what will probably be little more than a day’s stay in Honduras, if you cross the border from Guatemala at El Florido, which is very close to the Mayan City of Quirigua, then you will find the visa is free and the border is quite a relaxing adventure – there is a tourist tax of $3 or so. 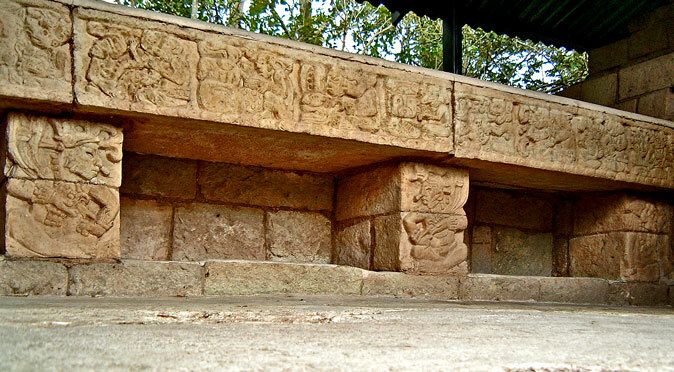 Copán marks the southern boundary of the Mayan region and was founded in the 5th century by Tikal to control the jade trade flowing down the adjacent river and feed it back up to Tikal and the Mayan territories by land, sea and river. The riches of trade and the security of its remoteness allowed Copán to develop some of the most sophisticated forms of art and sculpture found in the entire Mesoamerican sub-continent. 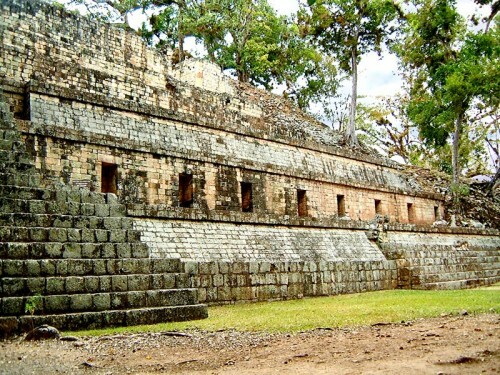 Considering the ease with which you can trip across the border from Quirigua, an equally astounding Mayan site in Guatemala, these two sites combined make the trip to this remote edge of the Mayan territories extremely worthwhile.